Otters Enjoy Ocean-friendly Seafood And So Can You! There are 13 species of otters on the planet, and you can see two of them at the Houston Zoo! The smallest of the otter species, the Asian small-clawed otters, live in the Carruth Natural Encounters building. Danh Tu and Hope are a loving pair who have been together since 2014, though Hope has been at the Zoo since 2004! Like all otters, they love to eat and get a variety of different foods, including seafood. 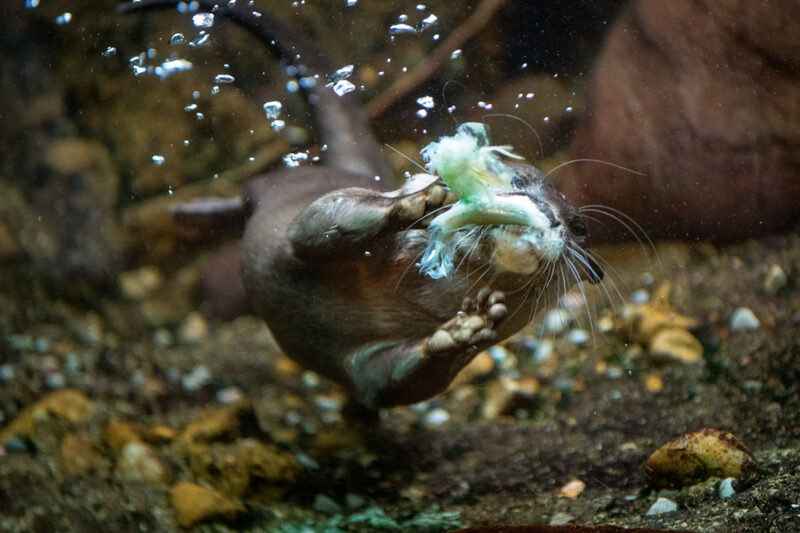 In the wild, small-clawed otters have a very diverse diet and much of that is mimicked here at the Zoo. Every morning, the otters enjoy silverside fish or capelin. Hope almost never eats the heads, while Danh Tu is much less picky and rarely says no to any food. In addition to fish, Hope and Danh Tu eat crabs, shrimp, mussels, and clams. All these items are the same human quality food that you might buy at the store or order in a restaurant. And it is all sustainably caught! 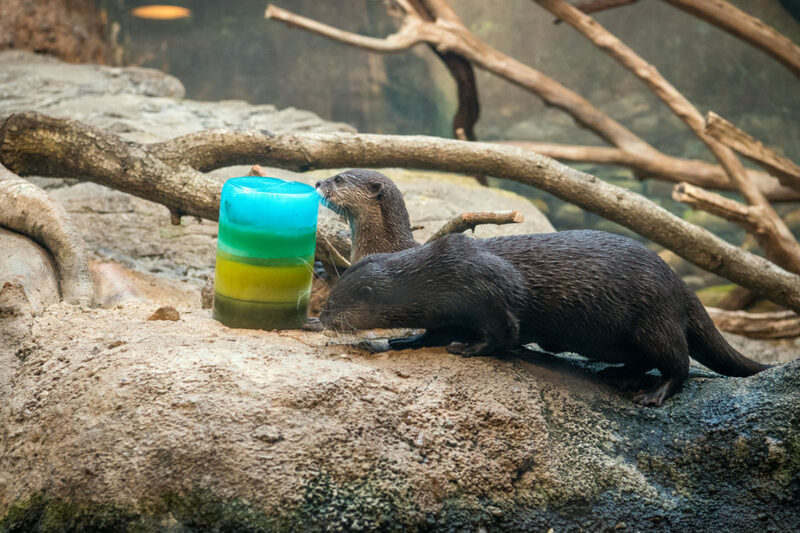 To add even more variety to their day, the otters sometimes get their seafood in frozen blocks of ice. 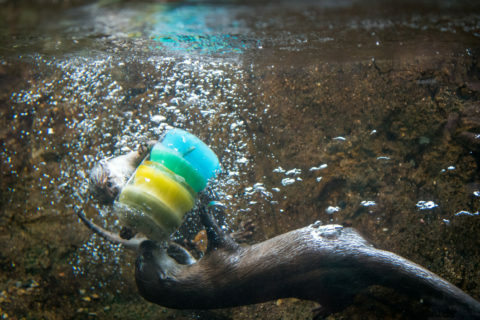 This enrichment keeps the otters very active as they work to free their favorite foods, and it shows off their amazing ability to swim and use their paws as little hands. You, too, can eat sustainable seafood like Danh Tu and Hope. Next time you buy packaged fish in the store, look for a variety of logos that let you know the seafood is a sustainable choice. You can also use the Monterey Bay Aquarium Seafood Watch app to see what seafood options at the grocery store or your favorite restaurant are sustainable, so you can help save animals, like otters, in the wild! Share via Facebook: Otters Enjoy Ocean-friendly Seafood And So Can You! Share via Twitter: Otters Enjoy Ocean-friendly Seafood And So Can You! Share via Linkedin: Otters Enjoy Ocean-friendly Seafood And So Can You! Share via Email: Otters Enjoy Ocean-friendly Seafood And So Can You!